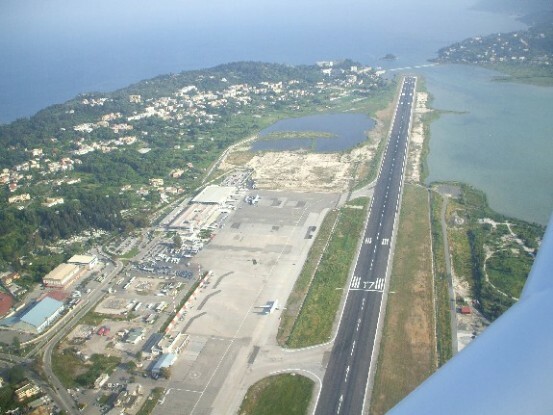 Corfu International Airport or Ioannis Kapodistrias airport, named after Ioannis Kapodistrias distinguished Corfiot European diplomat and first Governor of Greece, the airport is located around 3 kilometres south of Corfu Town and half a kilometre north of Pontikonisi. The approach and landing, in a northeasterly direction, affords the flying passengers a spectacular aerial view of Pontikonisi and Vlaherna Monastery as well as the hills of Kanoni as the runway used for landing is actually a few hundred meters away from these spectacular landmarks. 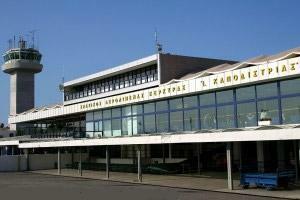 The airport entered operation in 1962 and become international, the new passenger station finished in 1972.. 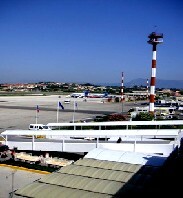 The airport offers domestic flights with Olympic Airlines and Aegean Airlines, but the vast majority of traffic in the summer season is charter flights for holidaymakers. The city of corfu is just few minute drive. You can found the information desk at the central of the terminal building. The Airport has post office. Lost property should be made to the information desk. There are three travel agencies and they have counters at the airport, also there is a health centre in the terminal building. You can spend your waiting time to the airport cafe/bar in the terminal building the cafe bar offer drinks and snacks.